Hannans vision is to build a successful exploration and production company. Our mission is to develop a company that has a material interest in a portfolio of mineral projects that are being rapidly progressed whether they are exploration, development or production assets. We recognise that a professional, knowledgeable and ethical team of directors, employees and consultants is the key to our business. Our focus is to provide shareholders with a satisfactory return on investment by managing our people, projects and capital in an entrepreneurial and responsible manner. Ultimately, Hannans is aiming to identify a world-class gold, copper, nickel or iron deposit. It is Management's opinion that Hannan' projects have the potential to host such deposits. Successful implementation of the strategic plan would see Hannans develop a portfolio of projects in which it is sole funding exploration, contributing funding to maintain a joint venture interest, holding a free carried interest, royalty interest and an equity interest in the company that owns the project. The ability to implement the strategic plan is determined by Hannans' ability to access funding. Hannans needs to continually fund the development of its project pipeline through equity raisings, project sales, joint venture expenditure and royalties. Hannans Reward Limited was founded in February 2002 in Torbay, Western Australia by Dr Ernest Dechow, Mr William (Bill) Hicks and Mr Damian Hicks. Mr Richard Scallan was appointed Chairman of the Board in Kalgoorlie, Western Australia on 23 May 2002. Hannans initial focus was exploring for precious and base metals in Western Australia and the Company assembled a portfolio of greenfields exploration projects in the Yilgarn and Pilbara regions of Western Australia and listed on the Australian Securities Exchange on 5 December 2003. Since inception Hannans has conducted extensive exploration campaigns incorporating geology, geophysics and geochemistry at its East Pilbara, Forrestania, Lake Johnston and Queen Victoria Rock nickel, gold, iron and manganese projects. An iron deposit was discovered by Hannans in the Pilbara region and was subsequently sold to an ASX listed resources company. Hannans successfully added significant value to its gold and nickel portfolio and is currently seeking quality partners to co-fund future exploration campaigns. In January 2010 Mr Jonathan Murray was appointed a director of Hannans and thereafter in 2012 Hannans extensive manganese project in the Pilbara region was distributed to Hannans shareholders. 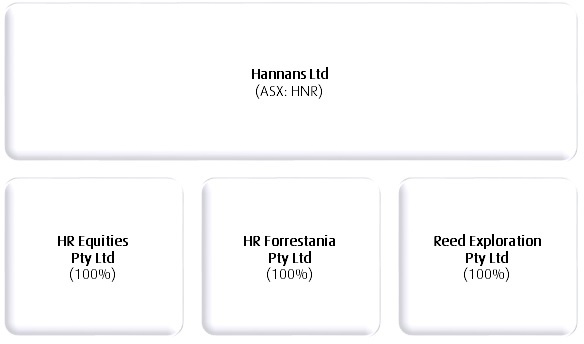 In 2012 Hannans acquired ASX listed Scandinavian Resources Limited including its subsidiary companies Scandinavian Resources AB and Kiruna Iron AB. The purpose of the acquisition was to gain access to the Kiruna Iron Project in northern Sweden and the portfolio of copper-gold projects in Sweden and Norway. Successful development of the Kiruna iron Project will enable Hannans to evolve from a company whose sole focus was greenfields exploration into a production company with a portfolio of advanced exploration projects. On completion of the acquisition in August 2012, Mr Olof Forlsund and Mr Markus Bachmann were appointed directors of Hannans. Hannans and its subsidiaries have completed agreements over time with major mining companies including Vale Exploration Australasia, Anglo American Exploration, Boliden and Rio Tinto Exploration. Hannans will continue to incubate highly prospective precious and base metals projects with a view to divesting its exciting portfolio to quality companies whilst retaining an exposure to exploration, development and mining success.